Pyracantha is a genus of about 7 species of spiny, evergreen shrubs that have a spreading to erect habit. Native to scrub and woodland margins from southern Europe to SW Asia, the Himalayas, China and Taiwan where mature specimens can reach heights of around 4 or 5 metres with a 5 metre spread. Pyracantha are commonly cultivated in the UK to grow up walls and other places where green coverage is needed but as bonsai, Pyracantha are eminently suitable for growth as erect trees. Pyracantha are especially favoured for their year-round broad-leaved foliage, their abundant flowering capabilities and for their numerous fruit in Autumn. The common name Firethorn is derived from the fiery berry colour and very sharp 1" long thorns that are carried on all branches. Leaves are narrowly ovate, dark-green to around 5cm.Small, typically white flowers are borne in corymbs in mid-Summer and can completely submerge specimens. The showy, spherical berries that follow by August/September are yellow, red or orange depending on the species or variety. 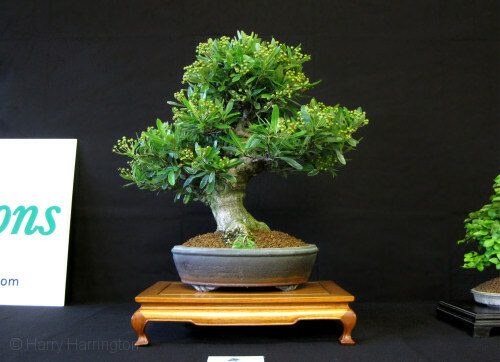 Pyracantha bonsai (Pyracantha angustifolia ) styled by Harry Harrington. P. angustifolia (meaning 'narrow leaf') itself has orange-yellow berries but there are many varieties now available which carry different berry colours. 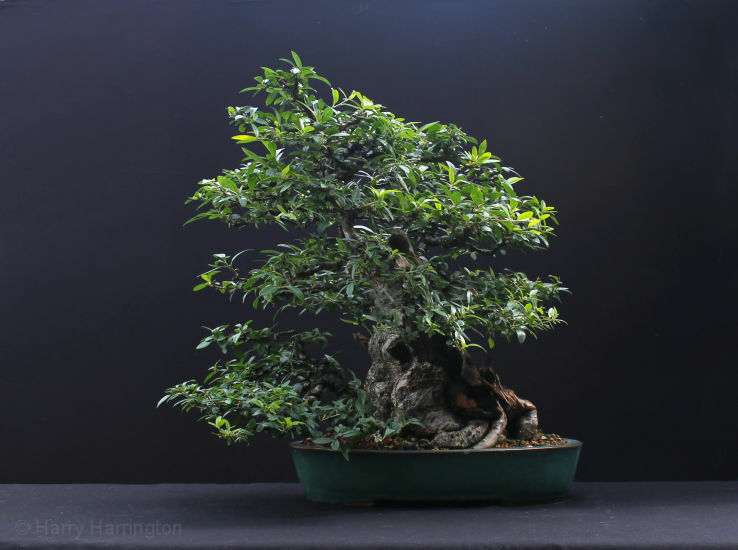 P. angustifolia is native to W China and is only reliably hardy to -2°C when grown in a bonsai container. Very similar to P. angustifolia varieties but more frost hardy. Native to SE Europe. Again there are a large number of varieties that carry different coloured berries. P. coccinea is widely naturalized on both coasts of the US, the Gulf states, & British Columbia. Position Full sun or partial shade. P. coccinea varieties are very frost resistant and although protection when temperatures drop below -10°C may need to be given. Most P. angustifolia varieties are fully hardy to at least -10°C during the Winter, however there are a few varieties that will not tolerate temperatures below -2 to -4°C. Repotting Repot every three to four years as leaf-buds extend. Pyracantha resent root-disturbance that can impede flower production. Pruning Prune old wood in early Spring or late Summer. After flowering, trim back new growth to shape. On recently repotted or weak trees, dead flowers can be removed to encourage vigour at the expense of berry production. Remove any individual large leaves. Remove spent berries in early Spring. Defoliation Remove all larger leaves in June to encourage ramification. Wiring Care must be taken when wiring as branches as young as 2 years old can be brittle. New shoots on Pyracantha's respond well to wiring but growth that has already hardened off can take a long time to set into a new position. Pests and Diseases Aphids, caterpillars, scale insects, leaf miners, fireblight. Problems Frost in late Spring can damage flowers. Be wary of pruning heavly in late Summer and removing flowering spurs. Premature berry-drop can occur if a tree is kept too dry during the Summer. Lack of berries (germination of flowers) can occur if there is a rainy spell during flowering. Styling Often seen with cascade forms, Pyracantha are also suitable for informal upright forms with single or multiple trunks. Suitable for all sizes.